The Thomas Fire is on course to become the largest wildfire in California’s history. As of right now, it’s burned through 272,000 acres, destroyed more than 1000 structures, and killed two people, including a fire fighter. It just one of 250 different wildfires that have burned up 8900 structures and killed 43 people in total across our state since October. This year has been so bad, it’s warranted its own Wikipedia page. The fires are not expected to be contained until January of 2018, and the cost of rebuilding – estimated at $180 billion by Accuweather – is steep. The recovery efforts will be massive and ongoing, likely for years. 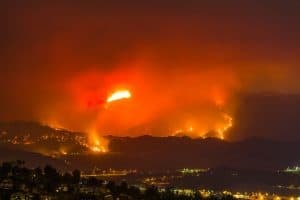 Governor Brown declared a state of emergency, and President Trump has given the wildfires federal disaster status, which will give our state access to federal funding through FEMA. The federal disaster designation offers one other critical benefit: it allows homeowners to make claims for their losses. Under the current laws (the new law has not yet been signed, as of this time), “disaster victims can deduct losses that aren’t insured and that amount to more than 10 percent of their incomes. Under the new tax plan, the deduction could only be claimed for those disasters that the president declares a federal emergency,” per Mother Jones. As of January 1, 2018, losses will be non-deductible unless the area is declared a disaster by the President. But even homeowners with insurance policies might be in for a tough road ahead. It could take months or years before you can return to your home, and even longer to get your claim paid out. After all, at least 10,000 property owners will also be making claims for losses – and insurance companies do not what to pay those claims when they can avoid it. Flames are not the only part of a fire that causes damage. Smoke or ash caused both visible and “invisible” damage, and it may or may not be covered by your policy. Depending on the value of your home and belongings, the policy limits could be far less than what you need to restore any structures, replaces and replace any items lost in the fire. The insurance company will rely on their insurance adjusters to determine which parts of your home have smoke and/or soot damage. The homeowner, however, should seek out an independent inspector or public adjuster. After all, the adjustor works for the insurance company, and the insurance company wants to keep its money. If your inspector gives you an estimate that is different from that of the adjustor, you may need a lawyer to help you reach a fair outcome. Remember, too, that homeowner’s insurance is intended to cover your entire property, not only the house. What this means after a wildfire is that you need to look around carefully to see what else needs to be fixed and cleaned. If a vehicle has been damaged by a wildfire, that claim won’t be paid by your auto insurance policy, but through a claim on your homeowner’s insurance. Did you have costly gardens or landscaping? What about a shed or detached garage? Your homeowner’s policy should cover those items, but may place very low limits on what you can claim for remediation (usually just enough to remove damaged or dead plants). We’re all in this together. The rebuilding efforts will be costly and time-consuming, but we will come out stronger in the end. Taylor & Ring is a premier personal injury law firm in Los Angeles, serving clients throughout Southern California. To learn more about our services, please call 310.776.6390, or complete our contact form.